Mongolian Beef – Enjoy P.F. Chang’s Mongolian Beef at home in just 30 minutes and it’s 10x better. Savory and sweet succulent beef with a crunch! 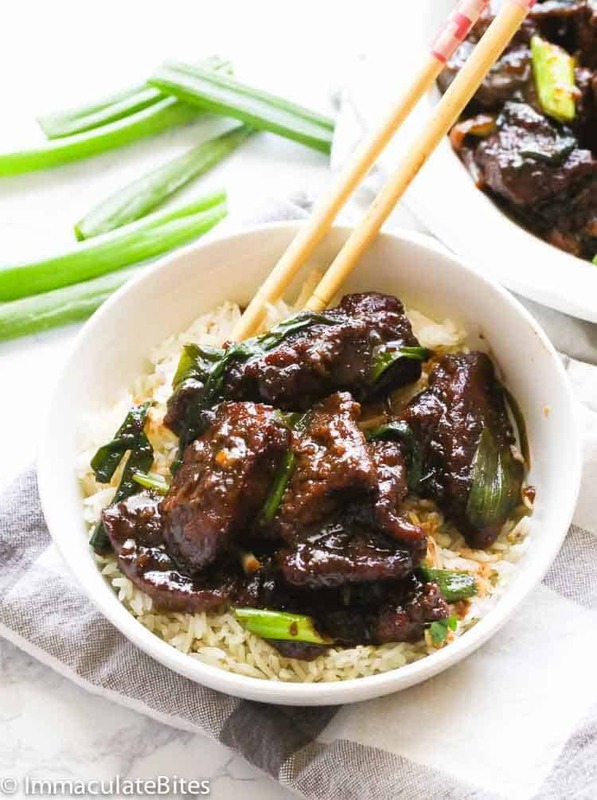 This Mongolian Beef is perfect when you are craving Asian flavors and don’t just want to travel to Asia or leave the comforts of your home to your favorite Chinese restaurant. Right here, folks, is your best bet! 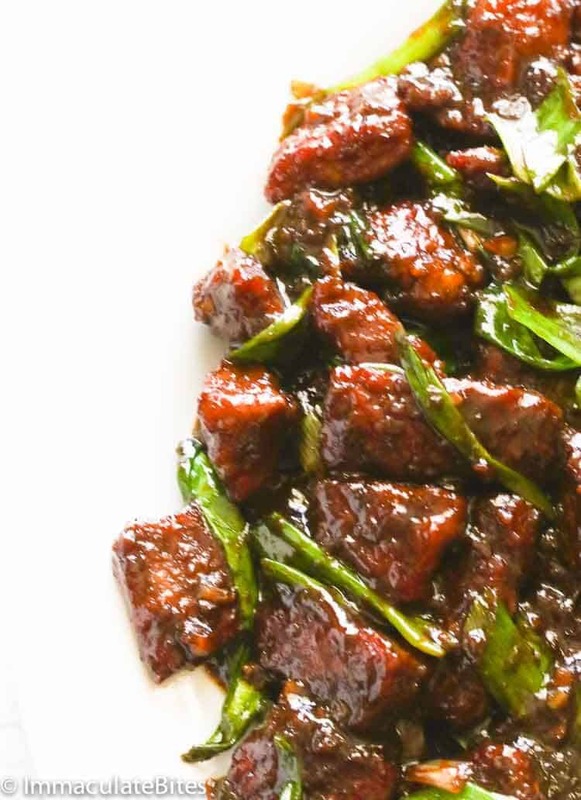 Mongolian beef is everything that we love about Chinese-American takeouts. It is a dish developed in Taiwan made of sliced beef that are stir-fried with vegetables in a glossy, savory and sweet spicy sauce usually made of soy sauce and brown sugar. Additionally, it is spiced up with aromatics like ginger, garlic and green onions. Moreover, some would even add chili for a little pop of heat. As always, adjust it to your preference. 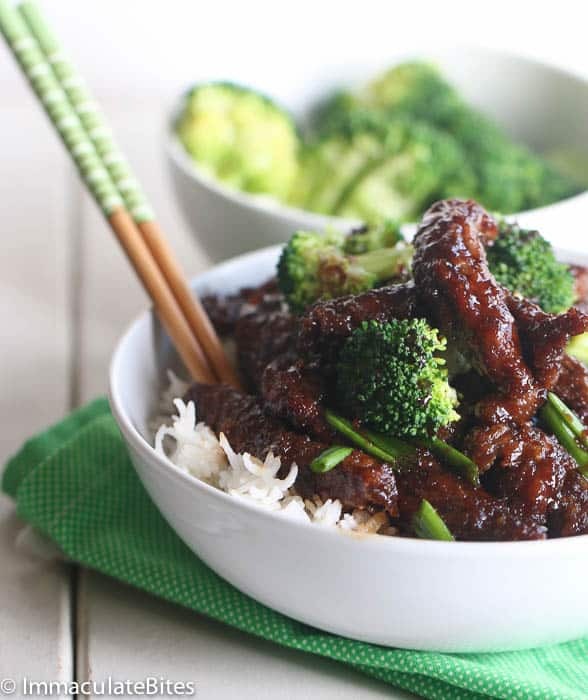 Mongolian Beef is the perfect definition of light, easy and delicious meal! What kind of beef is used in Mongolian Beef? What kind of meat can you use for this? I found out that sirloin steak is a perfect beef cut for this recipe as it is tender and cooks quickly. I just love sirloin! Flank steak, as recommended by most of the recipes, works great for this dish, too. Just keep in mind to avoid stew meat as it is tough. If you used any cheap cuts of meat, you have to marinate it with baking soda to be rewarded with a tender beef. I described the process of doing that in this Beef Broccoli recipe. What I really like about Mongolian beef is its distinctive crunch when cooked properly – which is a result of combining beef with cornstarch. Let’s be clear on one thing tho; this dish is not really a Mongolian dish. It is just a term used to describe it to make it more exotic- more of a dish served in Asian restaurants. Beef with a crunch, sweet, spicy and smothered in sauce. What is not to love? If you do not dig this, what planet are you on? 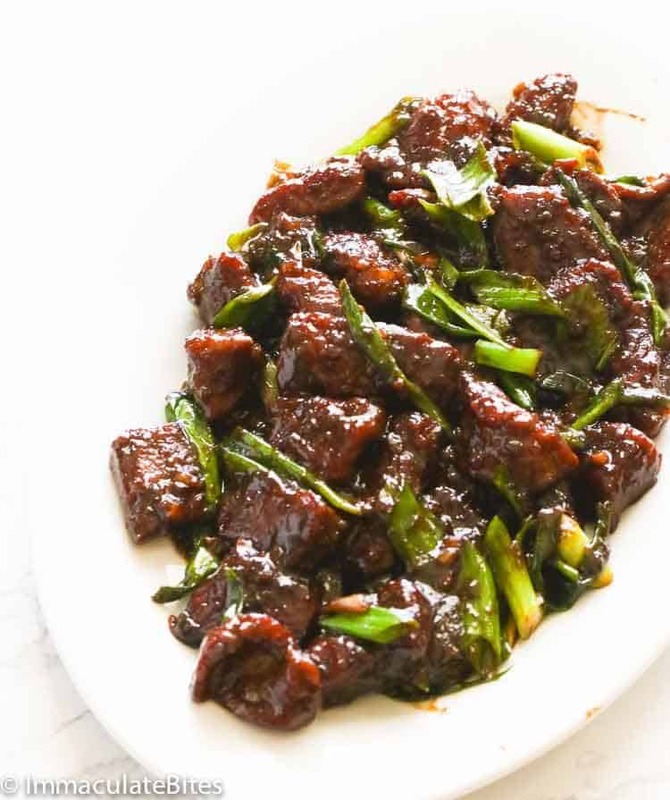 Quickly stir -fried beef with scallions, garlic, ginger – a sweet soy sauce with an amazing spicy zing. Beef lovers, carnivorous, spice lovers, all of the above – rejoice! As a last note, do not over cook the beef then it becomes tough. Throw in some steamed broccoli , if you want to include some veggies. Aside from sirloin steak, you can also substitute it with flank steak. If want to use cheaper and tougher cuts of meat, make sure to marinate it with baking soda for it to be tender. Throw in some steamed broccoli , if you want to include some veggies. Do not overcrowd the pan. Fry the beef in small batches to achieve a perfectly crispy meat. 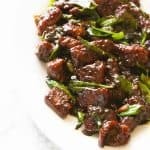 You can use light brown sugar instead of dark brown sugar, however, the addition of molasses in dark brown sugar adds more depth of flavor to this Mongolian beef. Mongolian Beef - Enjoy P.F. Chang's Mongolian Beef at home in just 30 minutes and it's 10x better. Savory and sweet succulent beef with a crunch! Slice the beef against the grain in little pieces. Then mix with cornstarch, baking soda and black pepper. Remove from cornstarch, shake off and let it rest for about 10 minutes. Heat up the wok with about ¼ -1/2 cup oil,, then add meat; let it rest for about 30 seconds before stirring. Cook for 2 minutes or until beef reaches desired doneness - it should barely cook in the center, stir the meat around a little so that it cooks evenly. Remove, transfer beef to a plate and keep warm. Add ab with about 1 tablespoon of oil to the wok, add ginger and garlic sauté for about a minute making sure the garlic does not burn. In a small bowl combine soy sauce , dark brown sugar and water . Add mixture to the wok , bring to a boil and stir for about a minute . Next, add beef to the wok . Bring to a boil, continually stirring for about 2 minutes. Finally add scallions, stir, turn off heat and serve over white rice. Slice the beef against the grain. Then mix with the cornstarch baking soda and black pepper. Remove from the cornstarch, shake off excess and let it rest for about 10 minutes. Heat up the Wok with about ¼ -1/2 cup oil, and then add meat let it rest for about 30 seconds before stirring. Cook for 2 minutes or until beef reaches desired doneness-it should barely cook in the center, stir the meat around a little so that it cooks evenly. Remove, transfer beef to a plate and keep warm. Heat up a saucepan or wok to medium heat (the oil should not be too hot) with about 1 tablespoon of oil, and then add ginger and garlic. Sauté for about 1-2 minutes making sure the garlic does not burn. In a small bowl combine soy sauce , dark brown sugar and water. Add mixture to the wok , bring to a boil and stir for about a minute . Next, return browned beef to the wok. Stir for another minute. Ran across your page and decided that today I would cook this dish. It was amazing! I had to facetime my boyfriend and tell him about how great it was. Sharing this recipe with my friends for sure! Awesome! Glad it turned out well for you. Hi Imma, this one is definitely going into my recipe book! We love MB. I made this and it was fabtastic! My family loved it. Thanks for a great, easy recipe! I made this late night. I followed the recipe exactly and it was a hit. The whole family loved it. Thank you! 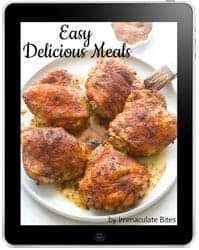 Hi i just want to thank you for sharing your delicious recipes. I made this one today i my son said to me “Mom this is better then any Chinese restaurant”. You are wonderful Imma. You are so sweet Maria. Thank you so much for taking time out to share this with me. Hello! My husband doesn’t eat beef – what other types of meat can I substitute in it’s place? Thanks! Hi Yvonne, Chicken or shrimp would do just fine here . Just made this and it was delicious! Thanks for a great recipe! One of my favorites!! This looks so delicious and it’s so easy! I really appreciate your website. I am a young african women who grew up in the US and i tend to cook the same thing all the time and of course its never african food. I will try most of your recipes. I applaude you and keep the great job. Do you happen to have a fried bean recipe? I guess I will have to try this! I am vegetarian, and this looks scrumptious. Wow. I love Mongolian beef and always order it at restaurants! This looks so fresh and delicious and of course simple to make! 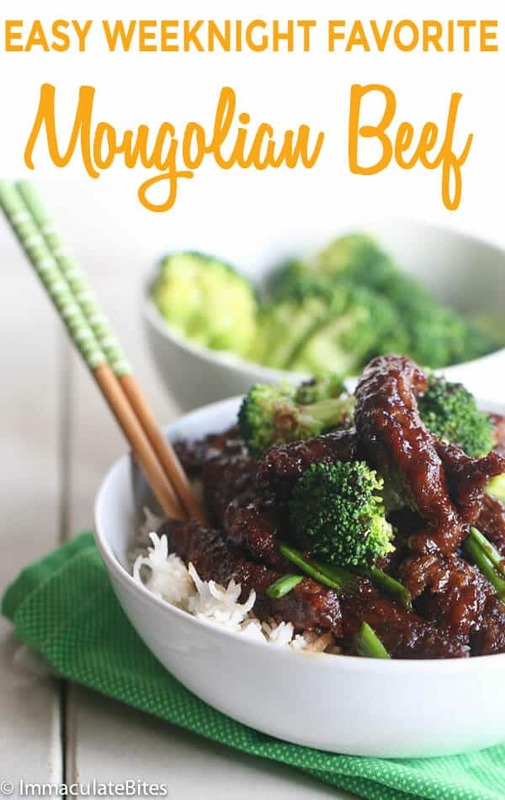 I’m now craving Mongolian beef so badly after seeing this recipe! Pinning and will try it! I respectfully disagree. This is not 10x better than take out. This is 100x better! This looks incredible Imma. I haven’t made Mogolian beef at home yet but when I do, this is the recipe I will be using. It looks exactly like the ones you get in restaurants here in Australia. Thanks Imma. You really are so talented. Is there anything you can’t cook??!! My Asian friend made this all the time when we were in college – really loved the flavor – but enjoyed the beef even more. I am not a very good cook but it sure looks easy enough. Will give it a try. Christine, let me know how it works for you.